The student team was made up of Juliette McGrane, Laoise O’ Brien and Rebecca Campion. 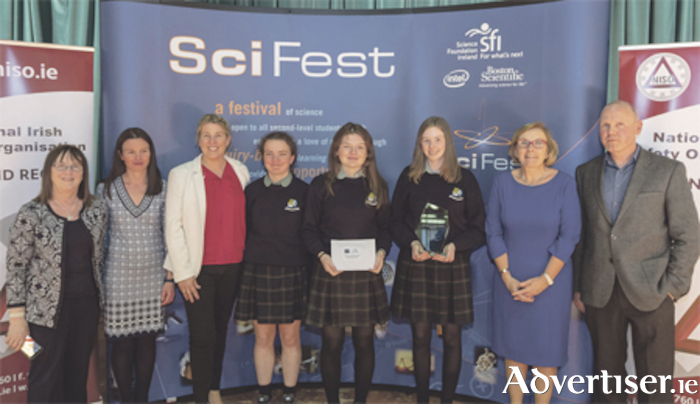 SciFest is an all-inclusive, all-island science initiative which fosters active, collaborative and inquiry-based learning among second-level students. It is funded primarily by Science Foundation Ireland, Intel and Boston Scientific. It involves second-level students showcasing science, technology, engineering and maths (STEM ) projects at a series of one-day science fairs held locally in schools and regionally in the 16 Institutes of Technology, DCU and St Mary’s College, Derry. The Science Foundation promotes and supports the study of, education in and engagement with STEM and promotes an awareness and understanding of the value of STEM to society and in particular to the growth of the economy. Sheila Porter, SciFest CEO, said: “2018 was a hugely successful year with another big increase in the number of students taking part. In total, 10,000 students exhibited their projects in local and regional STEM fairs across the country. As one of the 16 regional venues hosting a SciFest STEM fair, AIT saw more than 450 students from schools all over the region exhibit. The winners from Athlone Community College and each regional STEM fair go on to compete at a national final in November 2018. Page generated in 0.1141 seconds.